This is the 8th month in the Year of the Reader! I am excited to introduce of August’s Fan of the Month! 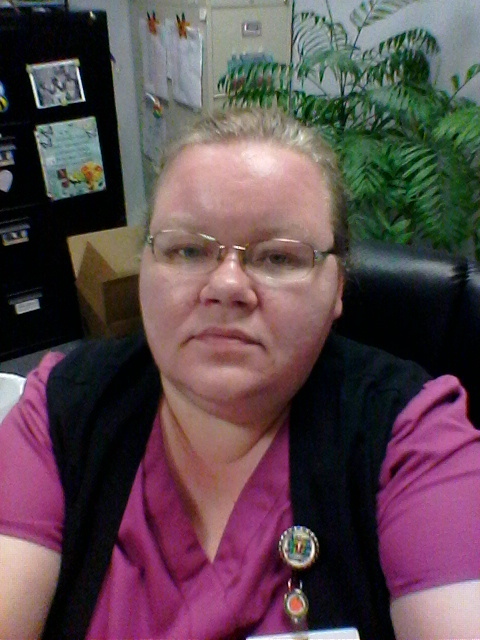 Tell us a little bit about yourself – I am the Assistant Director of Nursing and Quality Assurance Coordinator at a long term/Rehab/assisted living facility. I have been a registered nurse for 21 years and at my present job for the past 16 years. I am happily married and have a 14 year old son. I love animals and live on a farm. I love gardening, flowers, books, music from the 1920’s through the 1970’s, spending time with my family, painting and, did I mention reading. I love cozy mysteries but I will read anything- mystery, suspense, YA, romance, thriller, paranormal, fantasy, science fiction, Christian, etc. Where is your favorite place to curl up and Escape into a Good Book? My absolute favorite place to read (when the weather is nice) is sitting by the creek under the shade free-kick if the weather doesn’t cooperate, I’ll sit in my “reading room” in my grandmother’s favorite chair. My favorite book is “To Kill a Mockingbird” by Harper Lee- while in elementary school, we were required to read it as part of my gifted English class and it taught me a lot about myself, my beliefs, and my own family. My favorite series are: The Coffeehouse Mystery Series by Cleo Coyle, The Meg Langslow Mystery Series by Donna Andrews, Hannah Swenson Series by Joanne Fluke, and The Novel Idea Series by Lucy Arlington. What fictional character do you wish was real so you could meet them in person? If I had to pick a favorite fictional character that I would love to meet, it would have to Hannah Swenson from Joanne Fluke’s series- I fell in love with this series years ago and have all of the books in the series thus far (paperbacks or hardback, not e-books). How long have you been a Fan of Escape with Dollycas into a Good Book? I have been a fan of the Escape with Dollycas blog since I stumbled upon it 3-4 years ago and have been following by email ever since. My favorite part of the blog would have to be the introduction to new cozy mystery series as well as the wonderful reviews. I will often seek out the books in a new series (new to me at least) based on the review posted on the Escape with Dollycas blog. Thank you Amanda for being August’s Fan of the Month! Fans of the Month receive a $5 Amazon Gift Card and a copy of a book released during their month Brooke will be receiving Dream a Little Scream by Mary Kennedy!